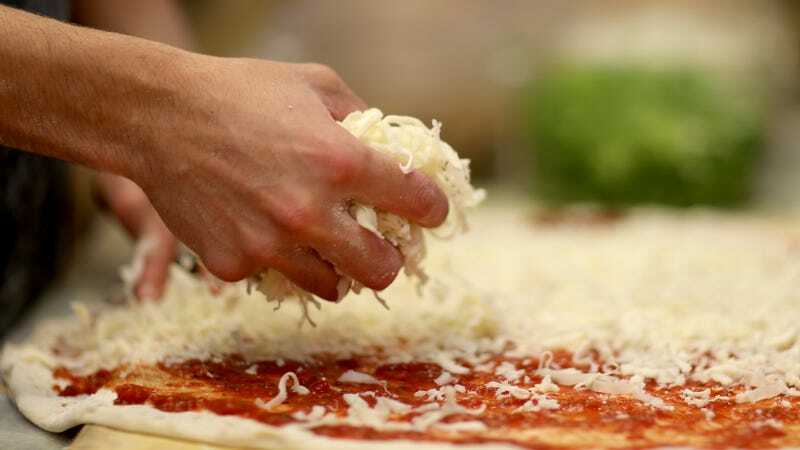 But The Independent reports that a pie topped with 111 different cheeses broke the record, a feat accomplished last week by an American chef at Vadoli Pizza in Berlin, Germany, last week. The previous record stood at 101. Naturally, I scrolled through the article to see a photo of this glorious creation, which I assumed would be enormous and maybe even beanbag-chair-sized. Actually, the pizza was pretty close to a normal-sized pie, with just 2.6 grams of each of the 111 cheeses sprinkled on top. According to Guinness World Records, the cornucopia of cheeses included mozzarella, Emmental, Leicestershire red, Comté, and Raclette De Chèvre. After the pizza was inspected by records officials, lucky diners actually got to eat it. One described the pie to The Independent as “crunchy and cheesy.” For real? You get to eat a world-record-setting cheese pizza and your best description is “crunchy and cheesy”? If I was invited to that pizza party, I’d wax Shakespearian.